For the past several posts I have been sharing with you about my convention experience. Near the end of our dinner at Bambara, we had an Artisan swap. Don't worry, we made extras for everyone (except the husbands). I haven't had time to photograph everything yet, but I do want to show you the gift I made for everyone. These are flip flops covered with the designer fabric. You may be asking "how did she do that? ", so let me just tell you a little bit about how I made them. First, I started with flip flops that I purchased from the craft store. I tried more expensive brands, but they were extremely difficult to work with, so in this case, "the cheaper...the better". I used jewelery needle-nose pliers and working from the bottom side I carefully removed the straps from the soles. The brand of shoes I used had the size marked on the bottom of one of the straps and L or R on the other strap for which shoe it was for. This came in very handy later when I was reassembling the shoes. After I trimmed out all the pieces, I removed the paper backing and placed the piece of fabric on the top of the corresponding shoe. Carefully iron the fabric to the shoe following the directions on the adhesive. (NOTE: At this point your family will probably walk into the room and think that you have totally lost your mind!) There will probably also be the slight smell of burning rubber, but if you don't have your iron set too high (mine was on the "cotton" setting), then I doubt that you will actually melt the rubber on the soles...but be careful just the same. Start at one end and work your way to the other end so that you won't have any air pockets form. After the shoes have cooled completely, make sure that there aren't any bubbles or places you missed with the iron. You can re-heat the area, carefully lift it while it is still warm, and smooth out any bubbles that may have formed. You may want to use an oven mit to protect your hand. If you are happy with the results, then use an exacto knife to cut a small "X" over the strap holes so that you can add the straps back on. I worked from the bottom and pulled the straps down through the holes so that I didn't loosen any of the fabric. Once you have the straps back on, make sure that none of the fabric came loose. If you need to repair a section, then carefully hold the straps out of the way so they don't come in contact with the iron and then re-press any sections that need to be repaired. Now that everything is back together, turn the shoes over and use your scissors to trim away the excess fabric. Be sure to hold the straps out of the way so that you don't accidentally cut them. Then use a Crop-a-dile to punch a hole on both sides of the toe strap. Insert ribbon and tie on a big pretty bow. Here is a picture I took in my hotel room of all the shoes I decorated for the swap. I was concerned all the bows would get squished, so I few in early so that I could sit in my room and tie on all the bows. Sorry about the quality of the photos...my hotel room didn't have enough light. That's basically all there is to it. This project was so much fun and the WOW factor was off the chart. I would have loved to added more bling, but I just didn't have time. Just think of making a dress for your little princess AND matching shoes...HOW FUN! I can't wait to see some of the cute projects you come up with. Next time I will try to show you the swaps I received from the other Artisans. One of the best things about the entire convention this year was being invited to attend the Artisan Award dinner. This was a private dinner for the Artisan Award winners and a few VIP's from the home office. We all met in the lobby of the Convention Center and walked over to Hotel Monaco's Bambara Restaurant about a block away. We took a brief moment to have our picture taken together before heading out. Standing (Left to Right): Amy Yingling (SU concept artist and Art Dept. Manager), Jenn Picard, Sandra Farrell, Amy Swartz (VP of Sales and Marketing-yes, she's expecting a baby girl), Heather Summers, Heather Klump, Heidi King, Cheryl LeFore, Melody Hyde (SU concept artist), and Laura Mellinger. Seated/Knealing (Left to Right): Summer Stone, Connie Collins (that's me! 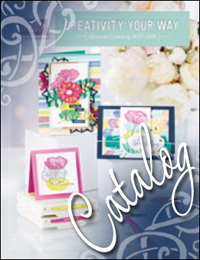 ), Heather Summers, and Shelli Gardner (Co-founder and CEO of Stampin' Up!). Not pictured are Amy Swartz's husband and Shelli's husband, Sterling. When we arrived at the restaurant there were handcrafted place cards, menus, and a very special gift awaiting each of us. (My little gift bag got a little beat up on the flight home.) Here's a closer look at the menu and that gorgeous paper flower. The person who made these must have spent hours on them. (Be sure to click on the photos to get a closer look...they are amazing.) You can only imagine that I just about fainted with excitement when I found out I was seated next to Shelli. I don't know how I got that honor, but let me tell you, I was thrilled. During the appetizer Shelli asked us each to tell a little about ourselves and our Artisan Award experience. That's about the time the tears began to flow. I don't think there was a dry eye in the room by the time the main course arrived. Each story was so inspiring and time after time we heard how much hard work, dedication, and determination went into winning the award. Amy Yingling, Melody Hyde, Amy Swartz, Shelli, and even Sterling also shared what it was like to be a part of such a wonderful company like Stampin' Up! As the evening drew to a close, Shelli asked us all to open our gift bags. Look at what was inside...a custom Artisan Award stamp for each of the winners! I have to admit, I heard that last year's winners received one just like this, but I was afraid to get my hopes up. At the end of the evening we had organized an Artisan Award swap. The concept artists asked if they could join the swap, to which we gleefully said "YES". We had already planned on making enough swaps for each other as well as Melody, Amy, Amy, and Shelli...but it was a super thrill to get a swap from the concept artists as well. We also included a swap for Laura Thomas (Shelli's personal assistant). Laura did a fabulous job of organizing the dinner, so we wanted to do something special for her as well. Here's one last picture to share...this is me with Shelli Gardner. Shelli is such a wonderful lady and so genuinely sweet. I know that I have said this over and over, but it was such a thrill to get to know her better. That's all for now. Next time I will share all about the swap and maybe even show you a few pictures (wink). In my last post I promised I would talk about Awards Night at convention. I honestly have to say that it felt like I had won an Academy Award. Isn't this picture amazing? I did a screen capture from the convention video and saved it to my computer. Here's the line-up from left to right: Heather Summers, Heather Stevens, Laura Mellinger, Heather Klump, Cheryl LeFore, Heidi King, Sandra Farrell, Jenn Picard, Connie Collins (me), Shelli Gardner (Co-founder and CEO of Stampin' Up! ), and Summer Stone (three-time Artisan Award Winner). Each of these gals are incredibly talented stampers/crafters. I feel totally honored and blessed to be chosen as one of this year's Artisan Award winners along side these amazing women. As our name was announced we walked up on stage, received a lovely flower bouquet, and had a group photo taken by the SU photographer. When we exited the stage we were each greeted by a Stampin' Up! employee who presented us with a custom engraved charm bracelet commerating the occassion. Now I have to back up and tell you a funny little story. The past two years SU announced the names of the Artisan Award finalists before announcing the winners. It is such an honor to make it to this level and I congratulate all those who achieved finalist. This year, however, they included the names of the winners on the finalist list. Of course, that makes perfect sense...you have to be a finalist before you can be selected as a winner...but they have never done it that way before. You can imagine how confused we all were to have our names listed as finalists. It was even more uncomfortable for me because they read the list in alphabetical order and I was the first winner to have their name listed. I was a little hesitant at first (thinking they had made some type of mistake) but I finally decided to stand. I found out later that the other gals were just as confused as I was. The other funny thing that happened during this awkward moment was that the cameraman left the camera on some of us a very long time. My good friends, Jenn Picard and Sandra Farrell, were on camera for what seemed like an eternity...to the point that it was comical. At one point I thought that maybe I had dreamed up the phone call and the display board...maybe I wasn't a winner at all. Then, as they called the winners to the stage, my name was listed last. I was soooooo relieved to find out that I wasn't hallucinating after all. After the awards ceremony we were all invited to attend an "after party". It was so much fun. This is me with my BFF and 1st level downline, Nancy Brown. Nancy wasn't even planning on attending convention this year, but after hearing that I had won, she quickly changed her mind. I can't tell you how much it meant to have her there every step of the way. I love you, Nancy! Well, that's all I have have for now. Next time I will tell you about our special Artisan Award dinner. I recently received the question "What is Memento Mall?" Sometimes I forget that not everyone knows, so I thought I would take a minute to explain. Each year at SU Convention they have a big room set up as a shop where you can purchase items unique to SU that you can’t buy any other time or place. In a way, it is a big incentive to attend convention. Most of the merchandise feature SU logo, in-colors, or artwork. In the past there were no limits, so the people who got there first would sometimes buy several of the most popular items for their down line and everyone else was just out of luck. The lines are always terribly long, but this is where you get to know new people and do some fantastic swapping. Fortunately, the past few years they have placed limits on how much you could purchase until the last day of convention. Then, in order to keep from getting stuck with merchandise, they lift the limits and it is a free-for-all. This year some of the items in MM included: clothing (shirt and a beautiful emboridered zip-up hoodie), Workshop WOW DVD, convention charms, nail files/kits, make-up compact, shopping bags, metal tins, rubic cubes with the SU in-colors, and I am sure some things I am forgetting to mention. On the second day they also offered a cute little SU Build-a-Bear that had on an adorable SU apron and one of it’s paws had Stampin' Up! embroidered on it. It also included a stamp that said “Life without Stamps is Unbearable" or something close to that. One of the best parts of convention for me was getting me meet some of my blog buddies. Cindy Major ("Encre, Papier, Ciseaux" or "Ink, Paper, Scissors") and I have recently been e-mailing each other and we finally had the opportunity to meet. Cindy is an amazing demonstrator from Quebec. She speaks French and English fluently and has the most adorable French accent. What you don't see here is the person who was nice enough to take our picture, Brandi Wiggins-Côté, (The Squareheaded Stamper). I could just kick myself because I didn't get a picture of the both of us. Brandi was kind enough to arrange an opportunity for me to have my picture taken with Jan Tink (Stamp, Paper, Scissors). Jan and I were both Artisan Award Finalists and she is so talented, clever, and just plain fun. Ever since the Catty Cruise I have been a little obsessed with uses for the new SU Lattice Die. I just about fell over when I saw how these gals and used fun foam and those little plastic headbands to make crowns. Aren't these cute? Although I don't know their names, I am fairly certainly the gal on the left (pink shirt) is the one who came up with this adorable idea. Since I don't have a daughter, I will definitely be making some of these for my great nieces. (I know that the phone will ring shortly when my mom gets a look at these!) I think it would be worth the price of the die just to make these. Of course, I could probably do a blog post on 101 ways to use the lattice die, well maybe not 101, but a lot. Speaking of my nieces, today I want to share with you one of my Artisan Award entries featuring my sister's granddaughter. I don't really do much scrapbooking, but I must admit that when I finished this page I really considered doing it a little more often. There is something very rewarding about creating something that you know will be treasured for years to come. I really wish I could get my scrapbook pages back, but since I have photos, I will probably just recreate them when I have the chance. I know that this color combination is a little unusual, but it really went well with her playsuit and her big, beautiful, brown eyes. Isn't she just the cutest thing? I will share some of my other scrapbook pages in the next couple of posts and along with even more convention stuff...so be sure to check back soon. One of the biggest personal thrills of convention was having the opportunity to meet some of the Catty Cruise Crew in person. We couldn't track down everyone for the group photo, but here I am with Becky Roberts (Inking Idaho), Brooke Stockman (Designs by Brooke), and Angie Tieman (Schwooo). Did you spot Linda McClain (Catered Crop) hiding in Becky's nametag? All I have to say is WOW...what a talented bunch of stampers...and super nice too. One of the funnest things about convention is Momento Mall. Here is a picture of Nancy and me trying to hold all of our convention goodies while waiting in line for 5 hours just to get in and then at least another 45 minutes in line to pay. So glad I remembered to wear my arm brace that day. (I have tennis elbow.) If I hadn't, I think I would have re-injured myself and believe me, I don't want to do that. This was one of my 3D entries into the Artisan Awards on display at convention. I used the Box #2 die to create the basic box and then added the taller house portion using card stock and DSP. I think this is one of my most favorite projects ever. I still have more to share, so check back soon. Hi everyone. I am home from convention in Salt Lake City and trying so hard to "catch up" on everything that needs to be done. Top priority, of course, is getting lots of hugs and kisses from my wonderful family. I miss them so much when I go away, but I had a ton of fun too! I want to share some of the highlights of convention. They announced the finalists for the Artisan Award and I was on the list. Of course, I already knew that I didn't win, but if you could have seen the hundreds of projects that didn't make the cut, as well as those that did...whew...let me just say that I am really honored to be among the finalists. There were fewer samples at convention this year, but most of the display boards were Artisan Award entries. What they lacked in quantity the sure made up in quality. I am sure that everyone will agree that the quality of the displays were over-the-top fabulous. This is one of my entries that was one display. Both of my 3-D items were displayed...so I will share those with you later this week. My scrapbook pages have yet to show up anywhere, so I will double-check to make sure it's OK to share those too. This was the first year that I have had two of my downline attend convention. Of course, Nancy Brown and I have been convention buddies for the past several years, but this year we added her downline, Veronica Winn, to our crew. (Veronica is on my left and Nancy is on my right.) It was so much fun. Veronica is so much fun to be around and really added to the excitement. There was rarely a dull moment this year. NOTE TO SELF: Don't wear a shirt with sequins and beads when planning to fly unless want to get up close and personal with the security lady in the airport:) Apparently the x-ray machine in the SLC airport didn't like my shirt. I can't even begin to share everything in one post, so I will try to post more throughout the week. Now I have to take my son to the dentist to have some teeth pulled (braces), so please pray that goes well. See ya soon!